When springtime with its gentle colour palette starts to blossom, it’s time to rouse your bedroom from its winter slumber. Get your bedroom ready for spring in no time with our help. When nature starts coming to life in spring, it’s the soft colours that surface that we usually notice most. The bright greens of sprouting leaf buds and fresh grass speak to our craving for the light and brightness of the season. Spring flowers are mostly draped in pastels and bring a smile to our faces with warm yellows, pinks and purples. The always-popular primrose complements spring’s soft palette with bright, bold shades. The dark time of the year with its discreet, muted tones is over – your bedroom is ready to come out from hibernation. Fresh colours invigorate spaces and bring springtime indoors. This is the perfect opportunity to give your bedroom a spring-inspired makeover. Bed linens in soft, airy pastels create a cheerful atmosphere. Reflecting nature’s slow awakening, this lovely palette brings brightness and freshness into your bedroom. Gentle pastel shades work wonderfully with neutral white, ivory and the natural colour of linen. Our wide range of colours and patterns give you a practically endless variety of options to mix and match. 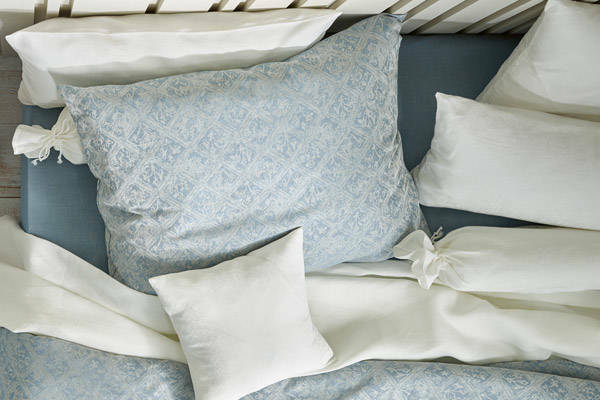 For a fresh look, choose a patterned bedspread in "Leinen" and pillows in solids such as "Petrol" and "Leinen". In the family of turquoise shades, our "Petrol" teal is more peaceful and toned-down than bright aqua blue, yet it still exudes a certain freshness and vitality typically associated with the shade. 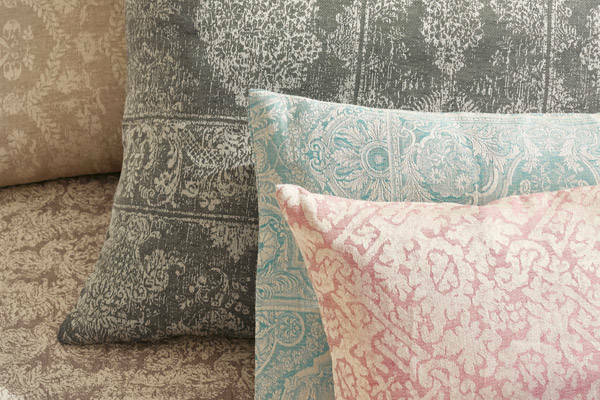 Why not add decorative pillows with a delicate pattern in the same colour? Our new SUMAVA design is lovely for adding a spring-like character to any room with delicate flowers, leaves and squares unfolding in the fabric. Our decorative pillowcases with ties exude an exciting feeling. Closed with ties instead of buttons, these pillows help create a playful style. Or, top off the entire look with an elegant bolster. Our colours "Amber" and "Pistazie" in combination with soft "Lago" or "Leinen" are perfectly suited for spring. Warm, sunny "Amber" radiates a certain cheerfulness and is the perfect preview of summer. Green "Pistazie" is fresh and full of energy, like a leaf unfurling in the sun. Pops of bolder colours intensify springtime shades. Add a special highlight with solid pillows in colours such as "Pistazie" or "Zyklame". Mix and match from our wide range of patterns and colours to create your springtime bedroom look and enjoy this beautiful time of the year.